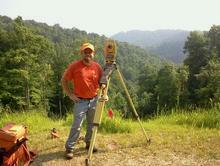 Moody Land Surveying was founded in 2000 in St. Marys, West Virginia. Since our company opened in 2000, we’ve provided a wide variety of surveying services such as Oil & Gas industry surveying, GPS services, pipeline surveys, topographic surveys, construction layout, elevation certificates, boundary surveys, & subdivision surveys. Other companies may offer similar services, but our services come with a personal touch. Our goal at Moody Land Surveying, LLC is to provide our clients with the highest quality of work at a reasonable rate. Committed to helping our clients reach their goals!